Seaford Town Council was thrilled to be able to assist local zoo, Drusillas Animal Park, after it appealed for bamboo donations for their hungry red pandas. 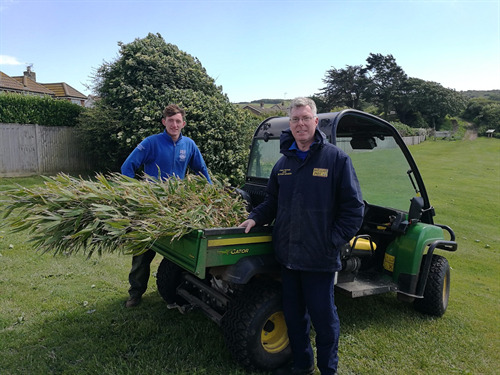 Having seen the appeal from Drusillas, the greenkeeping team at Seaford Head Golf Course got in touch as there is a large amount of bamboo growing along a footpath on the boundary of the course. Peter Holmes, Zoo Section Leader for Drusillas, came to the course and collected enough for a few days feed. They will be back for more bamboo in the future, as it benefits both; helping keep this area of the Golf Course clear and providing vital food for these hungry pandas. 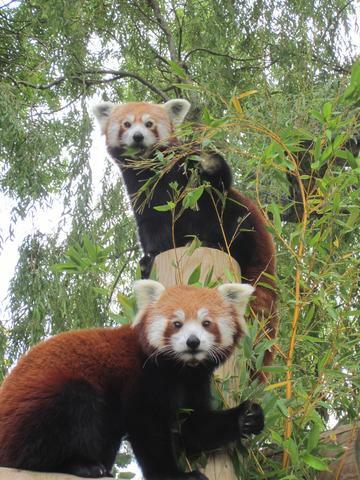 Drusillas, an award-winning zoo in nearby Alfriston, has faced an ongoing battle for its own plantation alone to meet the needs of the very healthy appetites of its resident red pandas, Mulan and Anmar. The zoo is therefore looking for any unwanted rooted plants as well as browse such as willow. Any bamboo is good as long as it's tall, fresh, healthy plants. Black bamboo is a particular red panda favourite, and both Mulan and Anmar enjoy small, leafy stems. If anyone is able to help, please contact Drusillas on 01323 874 100. Photos; top right, red pandas Mulan and Anmar; bottom left, Seaford Head Golf Course’s Apprentice Greenkeeper, Nathan Sutliff, and Drusillas’ Zoo Section Leader, Peter Holmes, collecting the bamboo.